With My Match, you can allow your invited program participants (both mentors and mentees who have been approved by you to participate) to browse or search possible mentoring matches. Your program participants can browse other invited program participants. Here they can learn more about each other based off the (public) answers each participant provided when they originally filled out your Recruitment Form. Once a participant finds a mentor or mentee they would like to connect with, they can invite that person to connect in a Loop. If the invitee agrees to the match invite, a Loop is then created. If the invitee declines the match, no Loop is created. Requesters/Respondents with excessive requests - Ensure eligible participants are communicated with and excess requests are closed off. Decline trends - Ensure people repeatedly declining for any one reason are reached out to and supported. If someone is declining repeatedly due to "no time", perhaps they should be removed from the program. Keeping on top of pending request timelines - Sorting the "Pending" requests helps highlight participants who have waited a long time for their respondent to approve or deny their request. Please reach out to respondents who have resulted in a particularly long wait, and see if you can help them head to the My Match history section of their sidebar to close of the request either way. 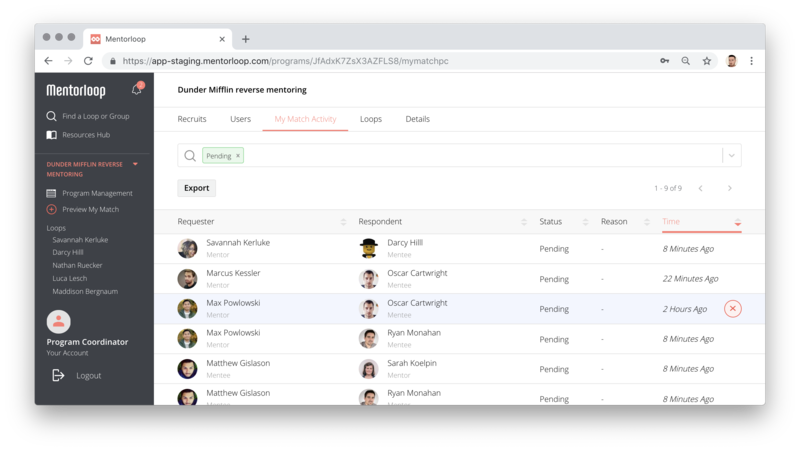 If you're unable to reach a respondent, you can archive their pending requests, and potentially consider removing them from your mentoring program. If you'd like to close off a pending request which has been waiting to long, first head to the My Match Activity tab in your dashboard. Then, hover over the pending request in question, and click the red x that appears. You can then send an optional message to the requester (via your Program Coordinator loop) letting them know why you've made this change. Please note an email is sent to the requester letting them know the request has been closed off regardless of the optional message being sent. Archived My Match requests can still be located by selecting 'Archived' in the filter box where the magnifying glass is, and selecting 'Archived'.